﻿ Social & Environmental Conservation Activities | KATO SANGYO CO., LTD.
To realize “People’s Happiness” by offering a “Rich Dietary Life”, as we value the blessings of nature, which are the sauces of food production, we will implement earth-conscious corporate activities which should be the foundation for sustainable social development under the corporate message of "Finding the Best Distribution Solutions.“ We think a “Rich Dietary Life” consists of the purchase of safe and secure products at reasonable prices for everyone, the enjoyment of diverse food that is rich in seasonality and regional characteristics, and the inheritance and nurturing of food culture. We think “People’s Happiness” consists of family get-togethers, bonds with other people, and a healthy and wholesome life. 1. We set environmental targets and implement environmental preservation activities. In conjunction with this, we put effort into responses for the prevention of environmental pollution and climate change that affect food production, improve environmental performance, and continually improve the environmental management system. 2. We comply with applicable laws and regulations and other agreed requirements. 4. We thoroughly disseminate this environmental policy to all employees and announce this policy publicly. To enhance efforts for environmental preservation, we have actively promoted acquiring ISO 14001 which is the international standard. As a result, we have acquired the certification in our 55 sites across the country. At KATO SANGYO, the entire company puts effort into the reduction of greenhouse gas emissions such as CO2, etc., which will become the cause for global warming. With the enforcement of the Kyoto Protocol, the demand for countermeasures against global warming grew and in order for KATO SANGYO to contribute to sustainable development while having a harmonious coexistence with the global environment, we comprehensively put effort into the reduction of CO2 emissions through the "Efforts on Creating Renewable Energy: Energy Creation" and "Efforts on Reducing Energy Usage: Energy Saving." 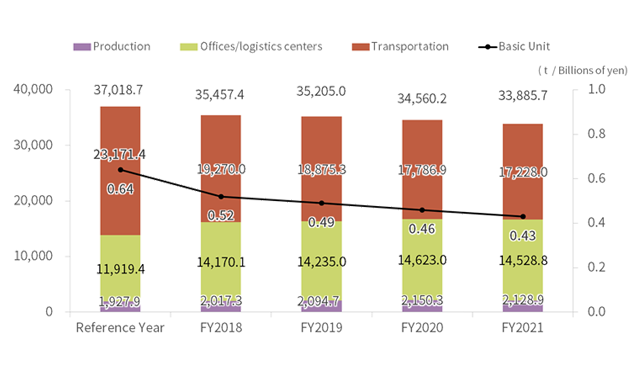 We have been comprehensively putting effort into the reduction of CO2 emissions associated with energy usage in each business activity setting including "Transportation" "Offices/logistics centers" and "Production", based on the data in FY 2013 as the benchmark. As a result of these efforts, we could reduce CO2 emissions by 4.2% in total as compared to FY 2013 and by 19.2% in the basic unit per sales. By promoting not only the reduction of CO2 emissions from our group's businesses but also the efforts to create renewable energy, we have been putting effort into the comprehensive reduction of CO2 emissions. We installed photovoltaic power generation systems with a total generation capacity of 2,784 kW on the roofs of our 9 sites. a "friendly company" to those who are involved with us. Since June 2011, we have produced and sold "Kanpy 780g Jam (five items in the series)" in which a donation to support those affected by natural disaster such as the Great East Japan Earthquake is included in the price. Donations so far have been used to support earthquake disaster orphans, etc., in Iwate Prefecture, Miyagi Prefecture, and Fukushima Prefecture through the contacts in the affected areas. 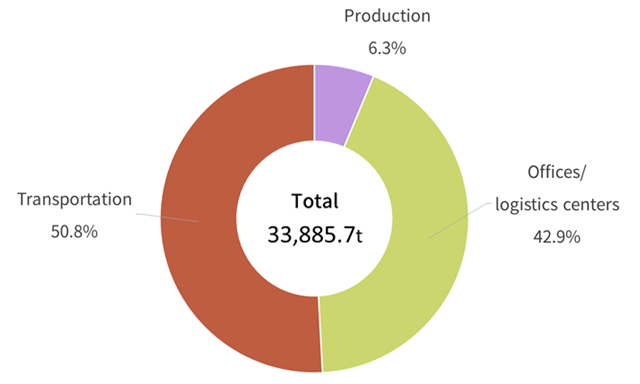 We began the eco-friendly cap activity in FY 2011. 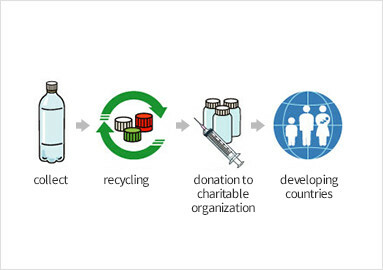 Currently, we provide caps to the recycling vendor which makes a donation of their selling profit to the "Japan Committee, Vaccines for the World's Children (JCV)." 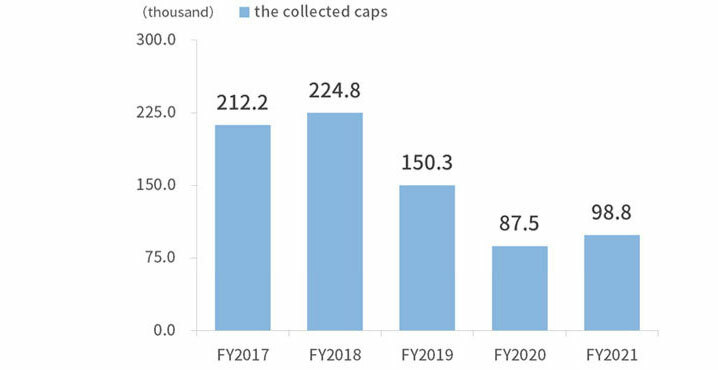 The entire company began collecting caps in FY 2013 and the cumulative total of the collected caps at the end of September 2018 was about 1,483,000. If converting this number into vaccines, it will be for about 1,787 children*. *The calculation was done based on 830 caps per vaccine.